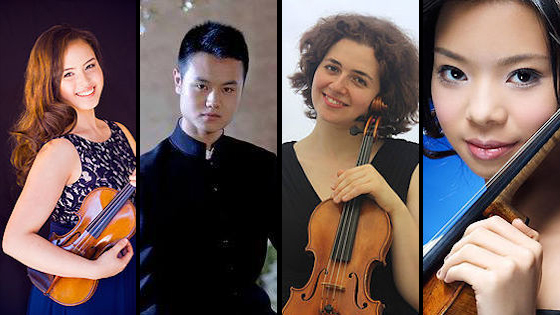 January 31, 2017, 3:50 PM · Congratulations to the four finalists announced Tuesday in the inaugural Elmar Oliveira International Violin Competition! L-R: Alina Ming Kobialka, Quanshuai Li, Hannah Tarley and Sirena Huang. Sirena Huang, 22 of the U.S.
Alina Ming Kobialka, 19 of the U.S.
Hannah Tarley, 25 of the U.S. The competition began last week at Lynn University in Boca Raton, Fla with 20 competitors, ages 19-31 from eight countries. The finals will take place Saturday and Sunday at Wold Performing Arts Center, where the four finalists will perform with the Lynn Philharmonia, conducted Guillermo Figueroa. Repertoire will include the Tchaikovsky and Sibelius violin concertos. The winners will be announced Sunday following the performance. Awards will include: First Prize $30,000; Second Prize $15,000; Third Prize $10,000; and Honorable Mention $1,000. The first prize winner will also receive career support, including management and public relations representation, as well as several other prizes and honors that will be announced. Jury members for the Oliveira competition include Daniel Heifetz (Chairman), Andrés Cárdenes, Gudny Gudmundsdottir, Ilya Kaler, Vera Tsu Wei-ling, Alexander Gilman and Charles Castleman. Below is Huang's semi-final performance. For other performances, visit the Elmar Oliveira International Violin Competition Youtube channel. February 1, 2017 at 04:13 PM · No Live Transmission? February 2, 2017 at 03:41 AM · Not that I've found -- I will let you know if I discover otherwise! February 3, 2017 at 07:01 PM · Looks like it will be streamed on their Youtube Channel: Here is the link. Prizes will be awarded Sunday, following the last performance, after a 30-minute intermission.